My mother, as a child in Italy, remembers hearing the name Prospero Frazzini. I've found many people from San Pietro Avellana, coming over to the US, listed their final destination as Prospero's bank and store at 2138 15th Street in Denver CO. None of my relatives knew any longer who this man was or if he was related to my grandfather. This page started with the very little I knew about Prospero and has grown as I learned more. In the search, I discovered my relationship to Prospero. We are 2nd cousins 3 times removed. Our common ancestors are Pasquale Frazzino and Beata Fantone. Of course, this is probably only one of the many ways we are related. Just the first one I've found. Much of what you are going to read in the following sections is derived from the emails from Franklin Smith (great grandson), Steve Frazzini (grandson), Bradley Terry (owns Prospero's former home), Jerri Frazzini Bottomly (grandniece), Wayne Frazzini (great grandnephew), Jolene Frazzini (great grandniece), Rita Timm (web site: http://coloradoclues.com), Wilberta Illig and Pat Lauterbach. 30 Sep 2003 - A flurry of new information from Steve Frazzini, a grandson, and Franklin Smith, a great-grandson, has shed a lot more light on Prospero. Its also helped clear up and coordinate information from Rita Timm and Pat Lauterbach. I've added much of it at the end of this page. 4 Dec 2003 - More ancestry information for Prospero. 23 Apr 2004 - Finally -- I discovered my relationship to Prospero. Updates in progress throughout this page. May 2005 - This page was getting too large so I moved the supporting documentation to a separate page : Prospero Frazzini Supporting Information page. Mar 2006 - I've redone this page to try to put it more into cornological order. No new information added. 19 Mar 2009 - I've collected my information specific to Prospero's Italian-American Bank and its predecessor the "Banca Popolare Italiana" into one web page. 25 Jun 2010 - After my first trip to Denver, I've updated many details on this page. 25 Jun 2010 - I visited Crown Hill Cemetery today and started a new web page with my photos. 7 Sep 2010 - I added a photo that was in Alisa Zahler's recent book "Italy in Colorado". While the site is being created you can email me : markd@silogic.com or sign the guestbook. 26 Sep 2003, Franklin Smith sent me this picture: "This shot shows Nestor and Bert on one horse, Emma in the middle, and my grandmother Teresa ( also my mother's middle name) on the other horse. Lina who was eight years older than Teresa is missing from the shot". Franklin believes the woman on the left might be Emma's mother. Original photo © Franklin Smith, used with permission. Prospero was born on 21 June 1866 in San Pietro Avellana, Campobasso, Italy (from LDS microfilm 1448675 #51). His father was Nicolangelo Frazzini and his mother was Francesca Carlino. Click here for more details of Prospero's ancestors. Franklin Smith told me of Prospero's first arrival in New York on 23 Mar 1883, aboard the steamship Italia. I cannot find a arrival of the Italia on that date. The nearest dates are 9 Apr 1883 and 14 Jul 1883. There is a P. Frazzini arriving on 10 May 1883 aboard the Grecian Monarch. The age is not readable. Prospero would have been 17 years old. The 1900 census indicated that he immigrated in 1884. The 1920 census indicated that he immigrated in 1883. In the 1908 article in The Denver Post (see below), Propsero said that he came to the US at the age of 16 (would be about 1882) and worked for four years in a store in Minnesota. 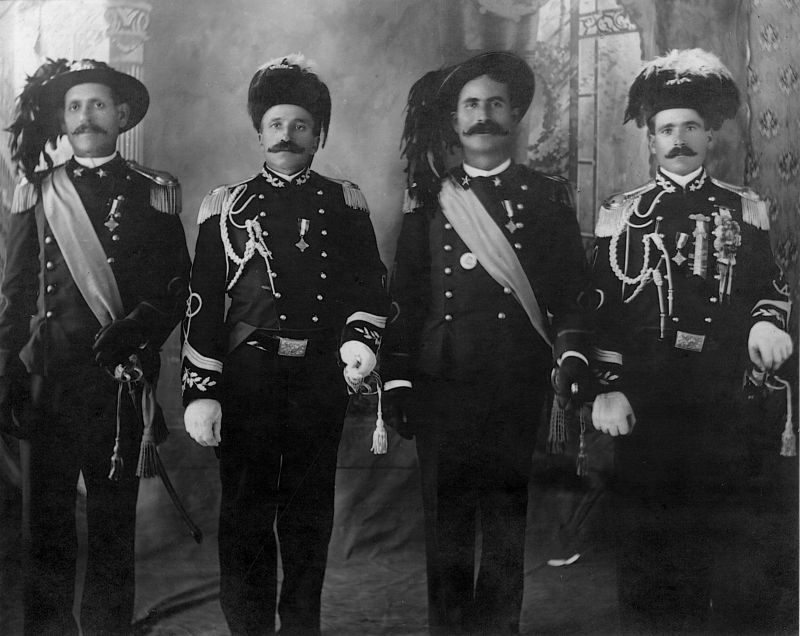 Then he returned to Italy (would be about 1886) to serve in the Italian Army. Prospero's older brother Felicito came to the US on the Chateau Lafite, arriving 18 Apr 1882, so he must have been in the US when Prospero came over. 1886-1890: Served in the Italian Army per his interview in The Denver Post (see below). He travelled with his brother, Antonio, and arrived on 17 Mar 1890 at the port of New York aboard the Italia. He was 23 years old. In the 1908 article in The Denver Post (see below), Propsero said when returned to the US after his time in the Italian Army, he first worked in a Section Gang for Denver and Rio Grande Railway in southwest Colorado. After about a year, he came to Denver (about 1891). 1891: Prospero opens a store in Denver. Prospero's first bank, Banca Popolare Italiana, stated about this time on 15th St. More at the Bank web site. It was probably run out of his saloon. This address was before the bank building was built but it is the same address. Possibly they raised the older building to build the bank. A newspaper article said the bank building was built in 1902. In the 1908 article in The Denver Post (see below), Prospero says his first store was at the same spot as his present store inplying that the first store was torn down. 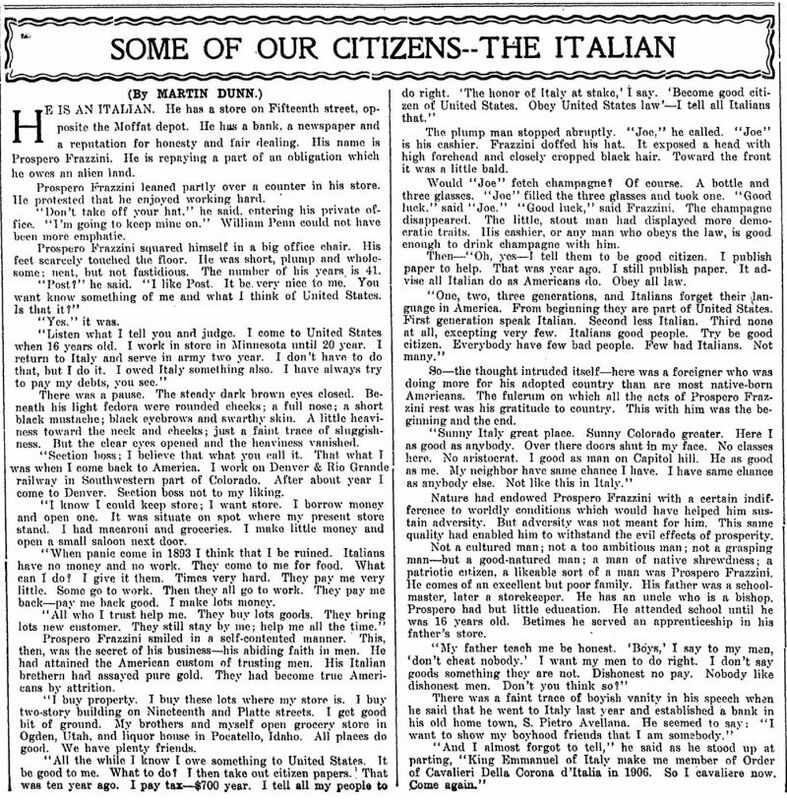 "William Milano is the editor and owner of the Italian Gazette of Salt Lake, publishing the only Italian paper in the Intermountain country, and he has secured for it an extensive circulation in various western states among Italian-speaking people. He was born in Aguila, Italy, in 1878. His father, Armedeo M. Milano, was a prominent business man of that city. The son was educated in the graded schools of Aguila and also attended Oviedo College at Sulmona, from which institution he was graduated with the degree of Bachelor of Arts. At the suggestion of his parents he then entered upon a mercantile career, but after a few years, realizing that his natural trend was toward literature and art rather than commerce, he pursued a course in the Belle Arts Institute at Aguila, one of the best known art schools of Italy. 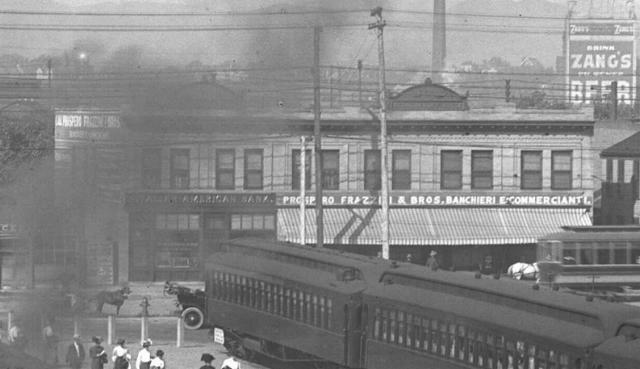 Mr. Milano came to America in 1906 to accept a position in the Italian-American Bank at Ogden, Utah, with which he was connected until 1910, when he resigned and removed to Denver, Colorado, with the intention of establishing a newspaper there. After a brief period in that state, however, he again came to Utah and in 1912 began the publication of the Italian Gazette at Salt Lake. This paper is of great interest and value to the Italian-speaking people in the Intermountain country and enjoys a wide circulation in Wyoming, Idaho, Montana, Nevada and Utah. As editor and publisher Mr. Milano has earned the respect and esteem not only of his fellow countrymen but of people of all nationalities, and his stirring editorials during the World war stamped him as one hundred per cent American. Mr. Milano is also the president and manager of the Milano Slide Company, which practically controls the slide making business of the Rocky Mountain and Pacific coast country. His ability as an artist is widely acknowledged, and his company has among its patrons all the leading moving picture houses, regular theatres and manufacturing firms in the territory indicated. By special processes invented by Mr. Milano both in photography and printing, he has accomplished such excellent results that the name of the Milano Slide Company has become recognized as a synonym for perfect production." 1895: Excerpts of Vital Statistics Notices, Lists And Selected General News Excerpts Appearing In Denver And Surrounding Areas. According to Franklin, Prospero had taken the name "Frank" when he first came over but then later returned to using Prospero (Comment: I've also seen a Faustino Frazzini who may have gone by the name Frank. Look at the Ogden UT web page.). When Prospero married Eugenia Milano in 1908, his previous wife was noted as deceased. It did not list a name. Prospero married Julia in abt 1895 (She is on the 1900 Census with him). They had 2 kids - Lena & another one that died in infancy. Arrived in NY on SS Pesaro, 30 Dec 1919 from Naples. Lina Frazzini, age 23, notation "wife"; nearest relative in Italy, mother-in-law: Perilli Agata, San Pietro Avellana; place of birth, Denver, Col. (Mark's note : she would have been born about 1897). Both shown going to Washington DC. Italian Embassy; both entries stamped "DIPLOMAT". For more on Giovanni Perilli and Lina Frazzini, click here. 1898: Ballenger & Richards twenty-sixth annual Denver city directory, Ballenger & Richards, 1898, 1441 pgs. This address is the same as the future bank building. A newspaper article said the bank building was built in 1902. Franklin Smith sent some information which shows a child who died in 1901. From a 15 Aug 1900 article in the Ogden Standard Examiner. The article says that "Mr. Frazzini of Denver" will be buying a property at the northeast corner of Lincoln Ave. and 25th St. The building will be used for saloon purposes. Describes the new P. Frazzini & Bros. store at 2138-40 Fifteenth Street. Mentions four partners Mr. P. Frazzini, Mr. F. Frazzini, Mr. T. Frazzini and Mr. C. Frazzini. I believe the T. Frazzini referred to is really Antonio Frazzini. The others are Prospero, Felicito and Caesare. Prospero's first bank, Banca Popolare Italiana, opened a storefront about this time on 15th St. More at the Bank web site. This bank also used the address : PO Box 747. Teresa Frazzini, age 16; Arrived NY on SS Berengaria Oct 17, 1921 from Cherbourg; handwritten notation "Niece". The person above her name is Rudolph Albi, age 47. Both going to 1650 Vine Street, Denver, Col. The manifest page was for US Citizens only. Doing the math, Teresa would have been born about 1905. For more about Dr. Albi, click here. In 2010, I got this photo from History Colorado. This photo orginally appeared in the book Italy in Colorado, Family Histories from Denver and Beyond by Alisa Zahler. The photo is circa 1905 and is Copyright © by History Colorado (Colorado Historical Society) and is used with permission. Click on the thumbnail photo to see a 72dpi version. 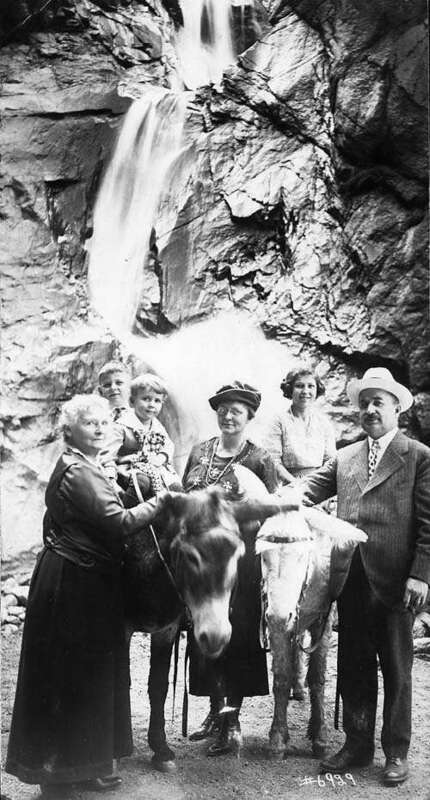 Photo from page 44 of the book Italy in Colorado, Family Histories from Denver and Beyond by Alisa Zahler. You can order a copy of the book at the History Colorado web site. Burial permit in The Denver Post on 9 Dec 1905. From a 10 Jul 1906 article in The Denver Post. Prospero received the cross of "Cavaliere Della Corona d'Italia". It was conferred on 2 June. Peter Albi received the honor at the same time. 1907 Establised the newspaper - La Capitale. Along with R.L. Barra, Joseph Cuneo, Frank and Pasquale DeCunto and Joseph Cella, Propsero established the La Capitale Publishing company. From an article in the 21 Jan 1907 issue of The Denver Post. Eugenia first came to the US, arriving 30 Oct 1907. She traveled with Prospero. Per the Ellis Island manifest, she was 23 at the time, never in US before, and born in Castel, Italy (probably Castel di Sangro, a town near San Pietro Avellana). Doing the math, she would have been born about 1884. The manifest lists her as Prospero's wife. If you look at the newspaper articles, we see that they were married in a church ceremony in Italy and then re-married in a civil ceremony in Denver. "Chevalier Frazzini Wins Bride in Italy; Last Saw Her a Babe in Arms". Very nice article describing how Prospero meet Eugenia Milano on one of his buying trips to Italy. "They were married October 11 according to the rites of the Catholic church by Bishop Angelo Baizano of Castel di Sangro, but because Frazzini was unable to furnish documentary proof of the death of this first wife, who died in Denver two years ago, the government of Italy would not permit a civil ceremony. Frazzini arrived in Denver with his bride last Friday and yesterday secured a license for the civil ceremony, which will be performed in a few days." The article includes pictures of Prospero and Eugenia. See the copy of the license below, it was dated 14 Nov 1907 but the wedding didn't take place until 16 Feb 1908. Franklin Smith sent me this Marriage Certificate, dated 16 Feb 1908. We have learned that they did marry in Italy but because Prospero could not show that his previous wife had died (this info from a comment in a newspaper article about the wedding), they only had a Church ceremony in Italy. They then had a civil ceremony in Denver soon after. Note the witnesses - Giuseppe Mapelli and L. (Louis) J. Stark. Stark was an attorney and defended Prospero at his 1925 trial. All four are shown going to Denver, 2138-40 15th Street. The three men were shown as born in SPA. All four are stamped "NON IMMIGRANT ALIEN" which is odd as that means they were entering the US as tourists or just passing through the county. There are notations "wife" and "bro" on the manifest. The ship was the SS Kronprinz Wilhelm, sailing from Cherbourg on 23 Oct 1907. Last permanent residence was Denver CO confirming that he had been here earlier. Note: I've never seen Calvini as a name from SPA - maybe this is Carlini (but Calvini is a good Italian surname). Summary Moffat Road station (Denver and Salt Lake Railroad, formerly Denver, Northwestern and Pacific), 15th (Fifteenth) Street and Bassett, Denver, Colorado; engine number 109 loading on track one, excursion train loading on track four, two railroad coaches on track two; trolley in distance; horse-drawn delivery wagon (Adams Express Company) backed up with supplies being loaded onto train; "Moffat Road" sign and billboard; other signs includes "White & Bower, Wholesale Hay", "Cremo Cigars", and "Drink Zang's Beer"; Frazzini & Brother (Felix & Prospero) Banchieri e Commercianti (2138 15th - Italian American bank); edge of gas expansion tank behind Moffat Depot. Photographer McClure, Louis Charles, 1867-1957. Used with permission : ©Denver Public Library, Western History Collection (http://digital.denverlibrary.org/cdm/). Below is a zoom in taken from a high resolution scan of the above photo. One of my other hobbies is trains (both model and real). There is a large following of a program called Microsoft Train Simulator. Another sim'er did a model of the Moffat Road route, whose station in Denver was right next to Prospero's bank and store as shown in the photo. I tried to update the scene so that it looks more like the photo. Click here for the results. An article in the 28 Sep 1909 issue of The Denver Post descibes the short marriage of Prospero and Eugenia. She was originally buried at Fairmont Cemetery but was lateer moved to Crown Hill. Frazzini, Prospero, head, age 44, widowed, born Italy, keeper-meat market, owns home, alien. Frazzini, Teresina, daughter, age 5, born Colorado. 1910 8 Aug Naturalization, 2134 15th Street, Denver, CO. Widower, Witnesses: Louis J. Stark, Attorney, and Carlo diIullo, clerk. Lists daughters Lina and Teresa. Stark was the same attorney who defended Prospero in 1925. 1910: The Colorado state business directory : Denver, Colo.: Gazetteer Pub. Co., 1910, 1648 pgs. 1911: The Colorado state business directory : Denver, Colo.: Gazetteer Pub. Co., 1911, 1637 pgs. Bernarda Morelli, 20 yrs, "servant of the family"
The Ellis Island manifest clearly says that Degna is going to meet "her husband Frazzini Cesare at 2138-40 15th St Denver". All were born in SPA. Prospero had been in the US for 28 years previously. All are shown going to Denver from SPA. There are notations "children" and "servant" on the manifest. Travel was on the SS Duca D'Aosta sailing from Napoli on 8 Nov 1911. Prospero stated that his last permanent residence was Naples and his nearest relative was "His daughter at Naples." We know that Prospero's daughter, Lina, was going to school in Italy around this time. Franklin Smith sent me this picture of Prospero. Original photo © Franklin Smith, used with permission. He also sent me a copy of the 1913 "House Journal of the General Assembly of the State of Colorado" which lists Prospero "from the Representative District comprising the City and County of Denver." "Nineteenth State Legislature will be Two to One Democratic". 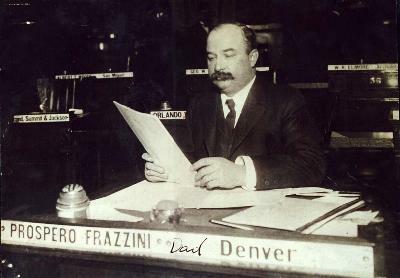 Prospero Frazzini (D), Denver, Denver. According to a note on his 1913 return, he was naturalized at City Court , Denver Colo, 1910. Travel was on the SS George Washington sailing from Cherbourg on 10 Aug 1913. 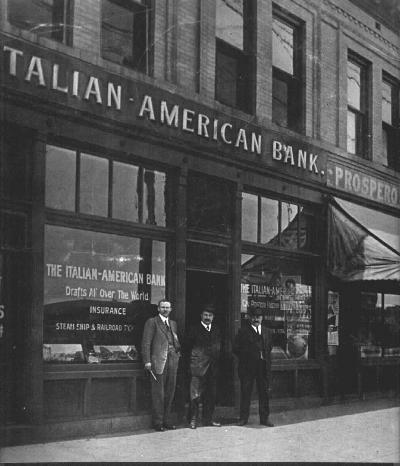 By 1913, the bank's name had changed to Italian-American Bank. More at the Bank web site. From a 5 Aug 1914 article in The Denver Post - Banker Frazzini Secretly Marries School Teacher - Miss Emma Nestor Becomes Bride of Richest Italian in West - Have Gone Abroad - Marriage at Cheyenne Kept Quiet, but Bride's Family Present. The marriage was 27 Jul 1914. 1. Emma was born 1/29/1880 in Nebraska & died 6/1969 in Denver. 4. Bertholdo was born 5/23/1919 & died 10/18/1990 according to the social security death index. 5. I know of no children of Nestor or Bertholdo. 6. Bertholdo's social security card was issued in Denver. 7. There is a Nestor who was issued a Social Security number in Oregon, and his last known residence was Walnut Creek, CA. He was b. 7/18/1916 & d. 11/8/1990. Do you think this might be the same Nestor? 8. I think the 1st 2 kids were by Prospero & Julia, & the 2nd two were by Emma. I don't know if there were any kids by Eugenia. 9. 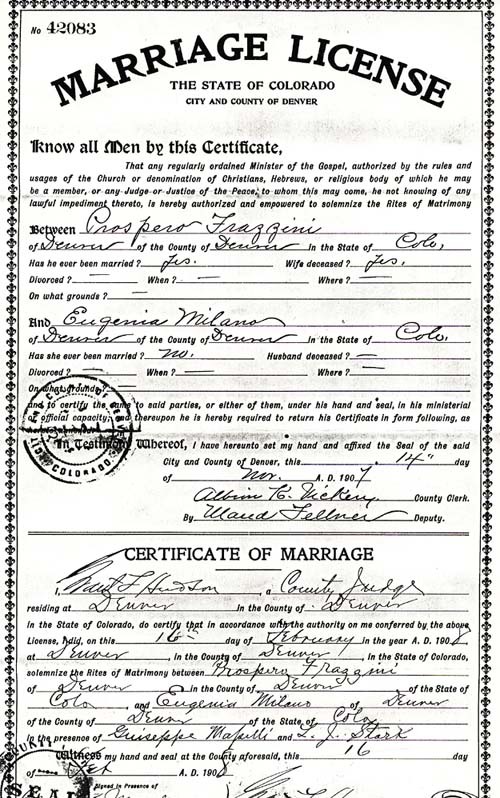 Marriage Dates: Prospero m. Julia abt 1895; m. Eugenia 2/16/1908 in Denver; m. Emma (third wife) ? My grandmother, Emma, was a strong-willed German woman (born Emma Nestor). I never heard her referred to by any other name than Emma. After Prospero died, she distanced herself from the Frazzini's and the Catholic Church and raised my dad and his older brother, Nestor, in a household where German was spoken so frequently that my dad could still understand bits and pieces of German when I was growing up. When we still lived in Denver, I remember meeting various of her German brothers and other relatives, most of whom hailed, I believe, from Omaha. The new information on the web site corresponds to my knowledge about my grandfather and grandmother, Prospero and Emma. Their older son, Nestor, married Mabel; but they were divorced sometime after I went away to college in 1965. Mabel and he had two children, Don and Joan. After the divorce from Mabel, my uncle married Dorothy (whose last name I don't know), and they lived together in Walnut Creek until Uncle Nestor died in late 1990. I think she may still be alive. My father, Bert, married my mother, Anna MacDonald Banner, during World War II. After the war, they lived in the Denver area until 1956, when my dad was transferred by his employer to the San Francisco Bay Area. They lived there until 1964, when another business transfer took them to Fresno, where both lived until they died, Dad a month before Nestor in 1990 and Mom earlier this year. I have one sibling, a younger sister named Susan. My father was never known as Bertholdo except to the army and air force, but instead always as Bert. Look at the email above from Steve Frazzini. 26 Sep 2003, Franklin Smith sent me this picture: "This shot shows Nestor and Bert on one horse, Emma in the middle, and my grandmother Teresa ( also my mother's middle name) on the other horse. Lina who was eight years older than Teresa is missing from the shot". Franklin believes the woman on the left might be Emma's mother, Bertha Wilhelm Nestor (1854-1955, yes 101y) who died in Denver. Original photo © Franklin Smith, used with permission. Here is a photo sent to me by Jolene Frazzini. Jolene does not know who it is, but Franklin thinks it is Emma Nestor Frazzini. The 1914 return, shows him travelling with his wife Emma, 35y, born in "Homahha", Nebraska. Shows Prospero naturalized on 8 Aug 1910 in Colorado, #150302. Both going to 2134 15th Street, Denver, CO. They are are listed in the general manifest where their names are crossed out and then again on the list of American citizens. Emma is indexed as "Frazrini". 1918 Frazzini and Zarlengo Coal Co. In a WWI Draft Registration for Alfonso Balzano, he listed as working for Frazzini and Zarlengo Coal Co at the bank address in Denver. 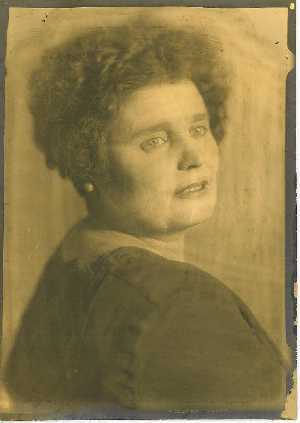 Alfonso's sister, Teodora, married Carmine Ernesto DiGiacomo and lived in Denver. The Zarlengo brothers, George and Charles, went on to found the International Fuel Company. The 1919 return also shows him as a US Citizen. It includes a month and day but I can't read it. Travel was on the Dante Alighieri sailing from Naples on 20 Nov 1919. 1920: Colorado state business directory : Denver, Colo.: Gazetteer Pub. Co., 1920, 1531 pgs. Ron Frazzini ( fraz0046 tc.umn.edu ) sent me this picture of Prospero and his brothers in front of the Italian American Bank on 15th Street. Original photo © Franklin Smith, used with permission. Left to Right: Cesare, Prospero, Felicito. "A dragnet was thrown out by police last night for Prospero Frazzini, president of the Italian-American Bank, which closed its doors yesterday morning with insufficient cash .... when it was learned that the bank president had disappeared from his home the night before. " Prospero had invested heavily in the International Fuel Company which had just gone bankrupt. The International Fuel Company was run by George and Charles Zarlengo. "Fear of Violence from Depositors Caused Him to Seek Safety, Says Frazzini"
"An apparent shortage of at least $50,760.51 exists in the accounts of the Italian-American Bank, which closed its doors last Thursday. ... Frazzini was arrested a few minutes after the information against him was filed at noon. He made no attempt to raise a bound of $10,000 on which he might obtain his freedom ..."
"Eighteen Notes Discovered Believed by Officials to be Fictitious"
Banker's Fortune Lost, Says Receiver 8 Feb 1925 Rocky Mountain News "Frazzini Sunk $287,000 in Fuel Company, Probe of Account Shows." "Prospero Frazzini, president of the defunct Italian-American Bank, pleaded guilty in the westside court Wednesday to a charge of embezzlement and grand larceny of bank funds and was sentenced to from five to seven years in the penitentiary." "Before entering the courtroom to make his plea and receive sentence, Frazzini, accompanied by his wife and his counsel, L. J. Stark, said "Whatever I have done that was wrong was done with the hope of saving the bank. I'm ready to take my medicine. I don't wish to to put the state to any expense by fighting the case"." ""What do you say to the charge - guilty or not guilty? ", the clerk asked. "Guilty." Frazzini replied, adding "but without malicious intent"." "The courtroom was crowded with depositors of the defunct bank and with friends of Frazzini. Frazzini was accompanied by his wife, who sobbed while her husband took the witness stand to tell the dramatic story of the rise from day laborer to bank president, and his crash from bank president to felon." "In passing sentence, Judge Sackmann scored Frazzini severely. "Your conduct thruout the whole case has been most despicable", he said, "You betrayed the confidence of your friends, brought disgrace on yourself and shame on your good wife and children." "... Attorney Stark broke in saying: "He invested in a small way in the International Fuel Corporation. Later he advanced more money to protect his first investments. Ultimately he put every penny he owned into it in a effort to save the bank. He mortgaged his own home and put the money into the company to save the bank. His brothers mortgaged their homes."" ""All I did that was wrong I did in an effort to save the bank," Frazzini said. "I admit I advanced large sums to the International Fuel Corporation but I was only throwing good money after bad. The money I put in later was all an attempt to get back what the bank had originally put in"." ""I came to the United States forty years ago. I started out here as a day laborer. I have two children by my first wife and two by my present wife."" Same information as previous article. "He was married twice and had two children by each wife." Frazzini Case Summed Up By Attorneys and $217,476 Shortages are Itemized. This article itemized the source of each piece of the shortages. 11 Feb 1925 Denver Post "The title of "chevalier" conferred by the Italian government on Prospero Frazzini, president of the defunct Italian-American Bank, for distinguished services to the Red Cross during the World war, may be revoked as result his pleading guilty to an embezzlement charge... according to Louis Cavallaro, secretary of the Italian consulate in Denver." The title was "Cavalliere Officiale to the Italian Crown"
"Frazzini made frequent visits to Italy. On his return from one of these visits, he announced a branch of the 'Banca Popolare Italiana' of Denver had been established at San Pietro Avellana, his birthplace, and that thereafter the bank would do an international business." "More Claims Filed." "Depositors for Fake Institution in Italy Continue to Present Books"
"Denver Authorities Are Joined by Consular Agents in Investigation of Whether Convicted President Transferred Stolen Wealth to Europe"
No money was ever found. From the Colorado State Archives http://www.colorado.gov/dpa/doit/archives/. Prospero died at Cañon City, Colorado on 28 May 1926. "Former Head of Italian Bank Had Served 15 Months of Five to Seven-Year Term"
"The prediction of Prospero Frazzini ... that he would not live to see the end of his five to seven-year prison term imposed on Feb 11, 1925, ... was fulfilled yesterday when the former leader of the Italian colony here died in the state penitentiary at Cañon City." "Despite the fact that he had been made a trusty in the penitentiary and had been given every consideration, his broken spirit was not equal to the task of driving his ailing body further." "Death came suddenly at 8:30 o'clock yesterday afternoon." "The body was at the penitentiary last night awaiting word from his wife and two brothers in Denver. His two children, a young boy and a small girl also reside here." Note: Steve Frazzini set us straight here. The two children were both boys, Nestor (named after Emma's maiden name) and Bertholdo (or Bert), Steve's father. Former Denver Banker Dies in Colorado Prison - Prospero Frazzini found Dead in His Cell. 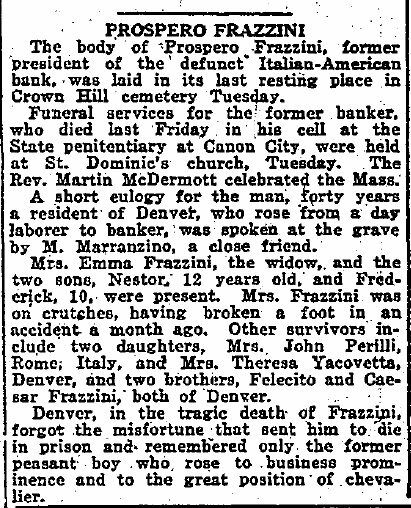 (about 28 May 1926) "Prospero Frazzini, former president of the defunct Italian-American bank.... was found dead in bed in the state penitentiary, Friday afternoon." "Death was due to natural causes. Penitentiary officials said Frazzini simply "wore out." His heart had gradually been growing weaker and for the last three months he had been bedfast. At 3 o'clock Friday afternoon, a nurse talked for a few minutes with him. Returning fifteen minutes later, the nurse found him dead." "Remorse killed Frazzini, his friends said, altho it is known that he was in failing health at the time of his arrest. He was forced to go to a hospital immediately after he was taken into custody." 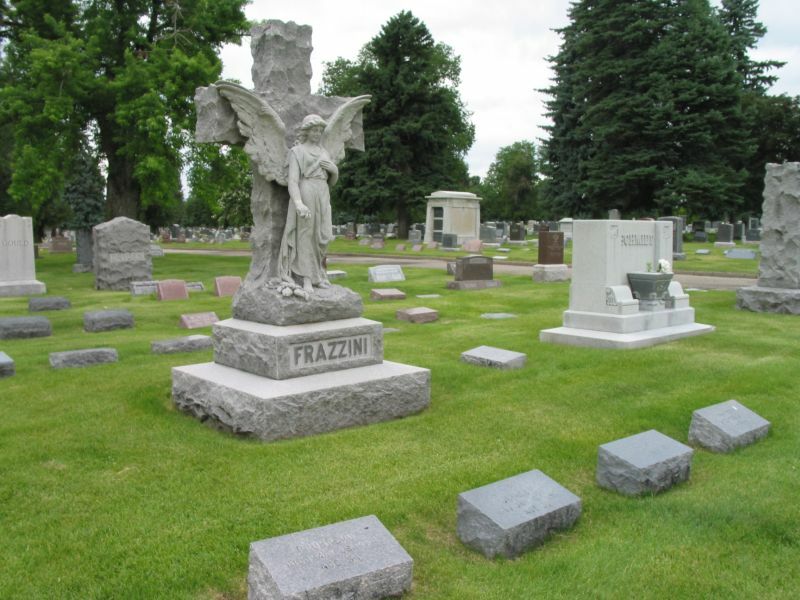 The Frazzini plot in Crown Hill Cemetery. Taken by me in Jun of 2010. Prospero's tombstone. Taken by me in Jun of 2010. For more tombsone photos from Crown Hill and Mt. Olivet Cemeteries in Wheat Ridge, CO, look at this web page. Prospero's Bank building today. It is numbered 2128 15th Street. Photo by Don Karch. For more on the bank, click here. For more about Cesare, look at his web page. For more about Felicito, look at his web page. He travelled with his brother, Prospero, and arrived on 17 Mar 1890 at the port of New York aboard the Italia. He was 20 years old. Previously in US 1890-1897, going to brother, Felice Frazzini, Denver, CO. There is a notation "HOLD" written on his entry. In the "Condition of Health" column, there is something written (other than "good"). I can't read it. The "fu Vintlangelo" in actually "fu Nicolangelo" and it refers to his deceased father. Antonio was travelling with Francesco Frazzini di Felicito, 10y, going to father, Felicito, Denver, CO. This is "Frederick" Frazzini, born about 1888. He was travelling with his uncle, Antonio. 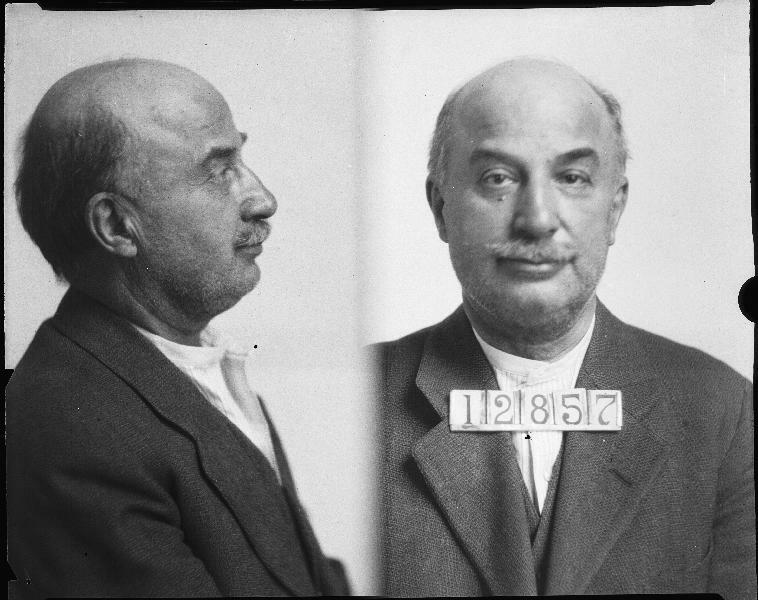 Antonio was naturalized on 11 Oct 1902 at the US District Court in Denver, CO. Joseph Mapelli (who was Naturalized the day before) and George Graney were witnesses. Lived in Ogden, UT. He was never married. Died 22 Feb 1912 at age 43 of appendicitis. "Antonio Frazzini, vice president of the Italian-American Bank and partner of the P. Frazzini Brothers Mercantile company, died at Ogden Utah, Friday, as a result of an operation for appendicitis." 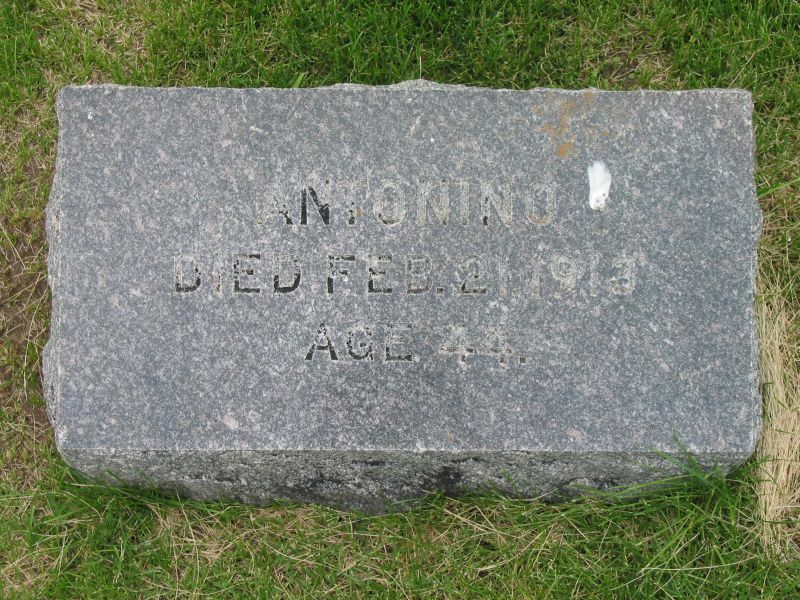 The death date was actually 21 Feb 1912, Thursday. From a 22 Feb 1912 funeral notice in The Dever Post, he was originally buried at Fairmont. On 29 Apr 1915, he was moved to the Frazzini Family Plot at Crown Hill Cemetery in Wheat Ridge, CO. Photo taken by me in Jun of 2010. Twin brothers who lived only one day. Born and died in SPA. died at Cañon City, Colorado on 28 May 1926. Prospero's birth record from 1866 gives the male grandparent's names. So am I sure these are right parents. The ages are parent's ages on the date of birth. Since the records start in 1809, I won't be able to trace this back any further with birth records. If I can find the death records of Sabatino or the other grandparents, I should be able to find the names of their parents. Or if I can find the marriage record, that could lead to great-grandparents. Sabatino Frazzini (Prospero's father) died 5 Aug 1831 at age 45. Sabatino parents were Pasquale Frazzini and Beata Fantone. Pasquale Frazzini died 28 July 1837 at age 72, he was the son of Giuseppe Frazzini and Constanza Mariani. Beata Fantone died 10 April 1838 at age 68. She was the daughter of Donato Fantone and Rosa Colaianni. Pasquale Frazzino is also the father of Ippolito Frazzino and this is the connection to my branch of the Frazzini family tree. You noted you had found Frazzini in my 1895 database. For starters there is considerable information on the Frazzini family in Colorado. To answer your question on Prospero: He and his brothers where here as early as 1887 there is much on him and family. The best way to give you info is via the newspapers. Frazzini, Prospero, "President of New Station Society"
Frazzini, Prospero, "President of St. Anthony of Padova"
Frazzini, Prospero, "Italian American Bank President Disappears"
Frazzini, Prospero, "Pleads Guilty to Embezzlement - Sentenced"
Frazzini, Prospero, "Dies In Prison"
Frazzini, Degna A., (Mrs.), "Wife of Italian Consul Dies"
Frazzini, Felicito, "Pioneer Merchant Dies"
Rocky Mountain News 12/14/1937 (Born: San Pedro, Italy 1863, lived here 57 years. Engaged with three brothers in importing business. Father in law of Anthony F. Zarlengo, Deputy District Attorney. Survived by: Jennie, Mrs. Edith Austin and Mrs. Zarlengo, Nicolas and Fred Frazzini all of Denver, stepson, Louis Francisco of Monterey Calif., burial in family plot, Crown Hill. It does appear the Prospero made a mistake that he owned up to. I have the article on his death. When the bank closed in 1925, a shortage of more than $200,000 was discovered. He went into the hospital at this time but never regained his strength of spirit. He pleaded guilty to the charges and on Feb 11, 1925 was sentenced to five to seven years by Judge Charles C. Sackman in West Side Criminal Court. In Nov of 1915, the King of Italy decorated him with the rank of Cavalliere Officiale, to the Italian Crown, the highest honor in the power of the government to bestow upon an Italian who remained outside the nation. At that time he was the only person holding the honor. There is most likely considerably more info, including the articles on the trial, but it does appear the family moved out of Denver in the early 1905 plus years. I did not see any bio's listed for them but there could be more. I suspect your Frazzini searchers have alot of this info, but I happened into this era on some research and picked up these few things while in there. What surprises me is that I didn't see all the brothers in the marriages, unless they are early enough to be in the "Arapahoe County Marriages", these are the ones I found in the Colorado State Marriages and Divorces. Appears some of the brothers married in Italy. You should be able to get info on Propero's prison record and mostly likely his trial transcript via the news article which would have the info in the time range. I didn't have a chance to look up the article on his quilty plea. I appears he made a mistake and the article does not indicate he was a criminal. It was respectful, in that his spirit was broken and he believed he would not live to complete his prison term, and he didn't. The one article has a nice photo of him. I live near Crown Hill, I might wander up there just to see how large the plot is. Hope this is a fun e-mail for you. Wife - Emma Frazzini, age 39, born in Nebraska. Shortly after Prospero's incarceration, the house was sold. We would be very interested to know what happened to Emma and the two boys after that. I'm sure things were very difficult for them. Another thing you might be interested in. A photo of Prospero and Brother's bank at 2138 15th street (also apparently where your grandfather stayed on his arrival to Denver). This photo was taken by the famous western photographer Charles McClure in 1908, and is on exhibit at the Denver Public Library Western History Photo Archives. I hope this is of interest to you. If we find anything else, I will pass it along. Yes, we have many of the newspaper articles. We are missing a few you have listed on your site, but now that we have the date, we can easily get them from the library. I think the story of Prospero is extremely interesting, his rise from laborer to pillar of the Italian community in Denver and his fall to felon. What comes across in the early newspaper articles after the bank closure is the feeling it must be an honest mistake - as sense of disbelief that Prospero could do wrong because of all the good he did for others. Then, the tide turns as evidence of fraud and forgeries comes to light. I am still wondering about Prospero's motives. Nonetheless, I am convinced he was a good person, and I don't think he ever intended to harm anyone. Anyway, after Prospero was incarcerated, the house was sold to an Irish family. The youngest two daughters, who never married, lived in the house until they died. The nephew, who sold the house, told us the family often searched the house for "hidden loot." Of course, they never found any, but seemed to have fun looking. The great thing is the two sisters never did anything to change the house. No remodeling or updating. It still has the original fixtures including sinks, bath, toilet, etc. All things that Prospero used. Sometimes I visualize him around the house. Anyway, we are in the process of restoring the house to as near original condition as we can. I would be happy to send you some before and after pics for you web site. I will be out of town for a week, but will get back to you. Also, if you are ever in Denver, please feel free to come over and visit the "Frazzini House." Bradley sent me this photo of the house. 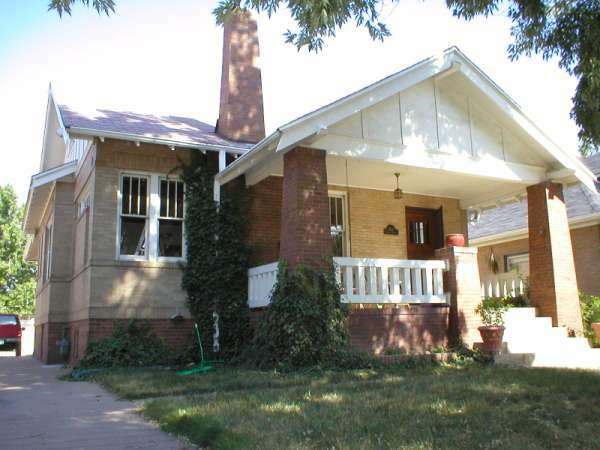 The house was featured in a column in the 5 Sep 2003 North Denver News. It was accompanied by a very nice article describing Prospero's story. These locations are written in big letters on the side of the bank building in Denver. Click here for that photo. Ogden, UT : in many manifests from Ellis Island, there are references to : Bank, Prospero Frazzini, 200-260 25th Street Ogden, UT. Click on that link and you can see some present day photos. From Heritage Quest Online, I found a series of Denver City Directories. Click here. Hello Mark. I am Franklin Smith, and I am Prospero's great grandson. Here's a little history. My mother and her two sisters barely knew they're mother Teresa Frazzini because she was divorced from my grandfather when they were small children, and didn't come to California with them. They're grandmother Julia Frazzini (Prospero’s first wife) died in 1905 at the age of 29 the same year Teresa was born. Lina (Teresa's sister) was 8 at that time, and later ended up marrying a famous Italian military doctor (said to be Mussolini’s personal physician). They lived in Italy, and had at least two children; one son was killed by the Nazis trying to escape Italy during ww2. I went to Denver many years back, and spent some time doing genealogical research, and compiled a lot of data. I also have my grandmother’s photo book. I met Mary Frazzini (90+years old) when I was there, and spent some time with her. I was led to believe that the rest Frazzini’s didn’t want to see me. I liked Mary, she was a very spirited person, and I regret not having returned the next year to continue our relationship. The rather bizarre story of Prospero obviously doesn't make sense, and it appears that some people hope it will die with them. My family and I have suffered from this because not knowing the underlying facts only creates a bigger stigma than the truth no matter how bad it might be. The facts are: 1. Prospero couldn't have done everything by himself, the charges were dropped against his brothers, he was the scapegoat, he received 5 to 7 years, and if I'm not mistaken could have been out in 3 for good behavior. 2. What could possibly be the reasoning for paying the (out of work) miners after the mines were failing or closing, unless he truly believed they would be reopened. 3. Prospero was an experienced merchant, banker, and politician, which means he wasn’t a fool. 4. He surrendered himself, pleads guilty, and died in prison after 1-1/2 years. (knowing that he would) This doesn't sound like a thief. 5. He was a popular international celebrity who had enough backing to have ended up being Governor. Would anybody steal money that they didn't use, and harm so many people? His honor and integrity recognized by so many (even the king of Italy) all thrown away for what? To willingly die in prison. The price of fame is sometimes the envy and hatred of others. I have heard that back in those days the Ku Klux Klan was a very powerful force operating out of Denver, and they hated Italians as much as blacks back then. An Italian Governor would be unthinkable to them. In Politics nothing is sacred with opponents seeking anyway to destroy each other. There are many possibilities of what really happened. When the mines closed. Mary Frazzini said her father Cesare ordered the mines closed giving yet another possibility of what happened. Was it an inner family battle between three brothers in a classic sibling rivalry? Prospero helped a lot of Italians enter the US, that your grandfather was a Frazzini is hardly a coincidence. 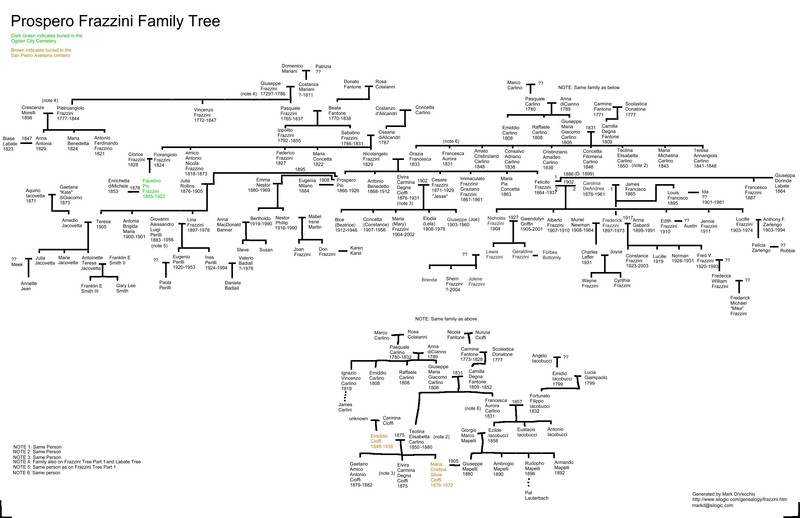 The genealogy in Italy is something I wish to pursue, but that will take time and money. Many Italians entering the US had their names misspelled or changed. 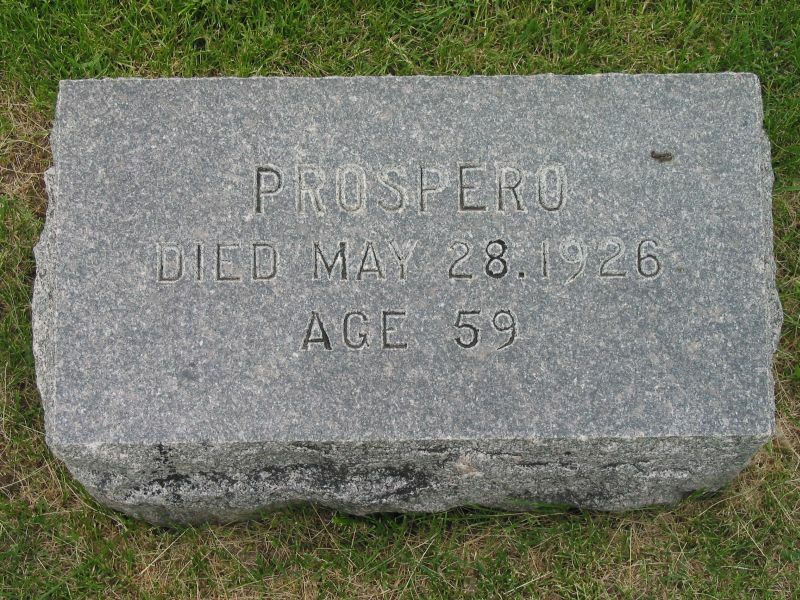 Prospero was first known in the US as Frank Frazzini. My grandmother's first name Teresa has been misspelled with an H half the time. Genealogy is not a perfect science. The underlying events may never be told, but I will continue to look for it for the rest of my life. I am Prospero Frazzini's grandson. My father, Bert, was Prospero's younger son through his wife, Emma Nestor. Both my dad and his older brother, named Nestor after his mother's birth name, died in 1990. There are four of us in this generation - my sister, Susan, and two cousins, Don and Karen, who were Nestor's children.Today I happened to come across your materials on the Frazzini family on the internet. Some of what was on the site, such as that my grandfather died of a "broken heart" in prison, are what I was told over the years, but much on the web site I had never heard before. The prison mug shot was fascinating - definitely my grandfather, from pictures we have of him. One curiosity - one newspaper article you quoted talked about him having a son and young daughter. My father, the younger son, would have gotten a kick out of that. After my grandfather's death, my father and brother were raised in Denver by their mother, Emma, who was of German ancestry. She broke off ties with the Catholic Church and Italian side of the family after her husband's death and raised her two sons in a German household. She supported herself and her two sons by selling insurance policies. Dad and Nestor stayed in Denver until the late 1950s, when first my father and then Nestor moved their families to northern California. Don, Karen, and Sue still live on the west coast, but I came east to go to college in the 1960's and never moved back. My grandmother stayed in Denver until sometime in the 1960s. After she became unable to live on her own, she came to live with us in Calif, but she wanted to return to Denver, which she did, and she lived there in a nursing home until her death. I would love to get copies of the newspaper articles and other materials about my grandfather and his family in Denver. Where does Prospero fit into your family history? As far as I know, none of his descendants through Emma have ever done what you did for the family tree. I, at least, have basically been cut off from any relations on my paternal grandfather's side. I don't think any of my generation have been back to Italy. Somewhere in your materials a earlier wife of Prospero is mentioned. Do you know anything about her? Click here for a list of people that I've found on Ellis Island that indicated they were going to Prospero's address in Denver. Here are some family stories that I've received from all the people who have sent me information about Prospero Frazzini and the other related families. As you read these, keep in mind that they are transcripts of verbal stories told by family members. They are, in all cases, the recollections of the person relating the story. For many, there may be no hard evidence that the story is correct. I present these here in that openness and as Franklin commented "if we don't talk, nobody learns anything". My connection to the Frazzinis is through my grandfather Rudolph Mapelli’s older brother, Guiseppe (Joseph) Mapelli. Joseph acquired a college education, and came to America in about 1897. He married his wife Silvia Chioffa in Italy in 1905, after getting his US citizenship. Silvia’s sister (Degna “Rose” Chioffa) was Cesare Frazzini’s wife. Cesare was Prospero’s brother. Jerri told me that Degna and Cesare were first cousins. Do any of you know how Degna Chioffa fits into the family tree, other than as Cesare’s wife? Note: Please keep in mind that these are family stories. Someone else may have a different recollection of what happened. If so, or if someone has something to add, I would enjoy hearing those recollections, as well. When he first came to America, Joseph resided in a shack with the Frazzinis - Prospero, Cesare, Felicito, and Antonio who were all bachelors at the time. Most of the Italian immigrants made their own accommodations, such as cooking out in the open, and sleeping under the stars. Those who had sheds or shacks were the capitalists of the day. The Zang family (who were in the beer business) lived across the street from the beer plant in a palatial home. Through family stories, there are two versions of how the Frazzinis got started in the saloon business. One version is that the Frazzinis had a dog that gave birth to a litter of puppies and they took one to the Zang family. The Zangs reciprocated with a half-barrel of beer. The Frazzinis took it back to “camp” (the term use in those days for the Italian clan residence) and decided to sell it by the drink; and thus a saloon was created. In another version of the story, a barrel of beer fell off of a truck. The Frazzinis picked up the barrel, took it back to the camp, put up a couple of planks, and sold it by the drink; and thus a saloon was created. In 1902 my Grandfather and another brother (Herman) came to America and also stayed at the Frazzini camp. By this time the camp had more than one shack, though I don’t know how many. Joseph and his brothers lived in one of the shacks. Joseph was working steady with the Frazzinis. He was clean-up man, bartender, advisor, and back pocket banker for all the Italian clans. Joseph put the money in a safe that the Frazzinis had at the saloon. Joseph was recognized by the elite Italians; trusted and capable of getting donations for many of the clans in many a crisis. He was unselfish and compassionate for anyone in need or in trouble. In time, he would be knighted by King Victor of Italy and the Pope and titled “Cavaliere” for his humanitarian efforts and deeds. As things went, the Frazzinis grew and finally they built a brick structure 2 stories high. The brothers lived upstairs. Then another adjoining building was built, and later another. The Denver Stockyards was across the street and that contributed to their good fortune. In time, Joseph created a small office in the Frazzini building and became Peppino the banker. He did all the bookkeeping from the book in his back pocket. The Italians didn’t have collateral, and this was a simple deal for them. It was easy to get credit. Later he acquired a state charter and Prospero opened the Italian American bank. Although it was listed as an Italian-American Bank, it was generally known as “Peppino” the banker. 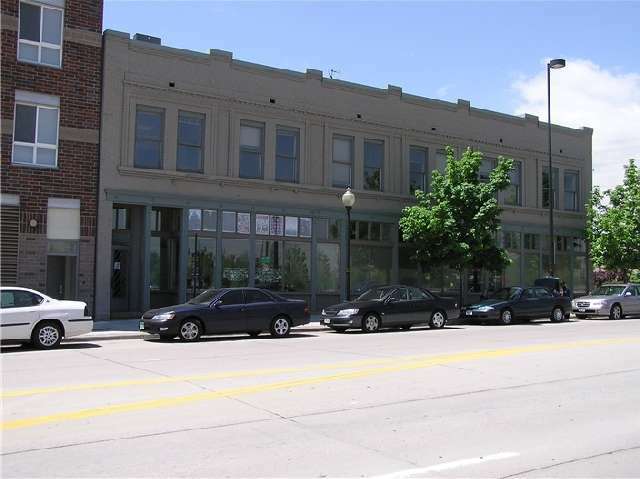 The bank was very successful and eventually moved from lower 15th St. to the southwest corner of 15th & Larimer. In about 1920 Joseph “severed relations with the institution.” I don’t know what led to him severing relations with the institution. Was it just time to move on, or did something happen? He got a job as Secretary of the Western Union Macaroni Manufacturing Company, and three years later he started a grocery business, which he presided over until his death. The banks back then were not regulated like they are today. When things went bad, people panicked. There would be a run on the bank, and it would go under. Lots of banks went under. And there had to be a fall guy. In this case, Prospero took the brunt of it. This information has been moved to this new page. Dr. Rudolph Albi - Dr. Albi traveled with Teresa Frazzini back from Italy in 1921. Dr. Giovanni Perilli - Giovianni Perilli married Lina Frazzini. This site will be under construction for a while.